Director: William Wyler. Cast: Bette Davis, Henry Fonda, Fay Bainter, George Brent, Richard Cromwell, Margaret Lindsay, Donald Crisp, Lew Payton, Theresa Harris, Georges Renavent, Spring Byington, Henry O'Neill, Eddie Anderson, Matthew Beard. Screenplay: Clements Ripley & Abem Finkel and John Huston and Robert Buckner (based on the play by Owen Davis). Twitter Capsule: The Bette Identity, aka sharp debut for actor-auteur pair that soon paid richer rewards. Garish but hot, like a red dress. VOR: ④ Not just the start of brief, bright, influential Wyler-Davis team but a swerve in what Hollywood allowed or even asked from its actresses. Interesting even in its unnevenness. William Wyler's Jezebel falls at an interesting point in Bette Davis' career; the film isn't all that much, but it has some exceptional moments, and you don't have to listen hard to hear Davis' career stepping into a higher gear. 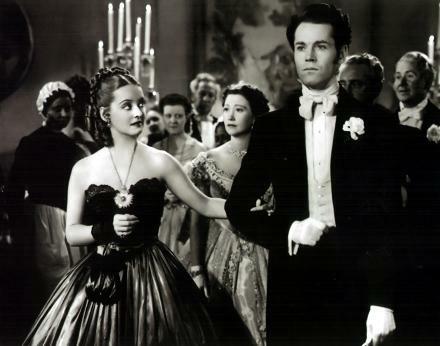 Though lots of people remember Jezebel as Warner Bros.' quickie attempt to beat Gone With the Wind to the ante-bellum punch, especially after Davis failed to win the role of Scarlett O'Hara, the film is much more interesting for its traces of Davis' own future roles and images than for its decoy status as a GWTW consolation prize. In fact, despite working from a play by a Pulitzer Prize winner and recruiting a young Turk called John Huston to punch up the script, the scenario of Jezebel is dully disjointed. The picture essentially breaks down into three acts which we might call The Dress, The Duel, and The Disease. The first is by far the most engaging, revolving around one of those special effects that doesn't cost a dime, and that only the movies can produce. Hot-headed, selfish Julie Marsden (Davis) is gruesomely irked at her on-again, off-again fiancé Preston Dillard (Henry Fonda) for refusing to abandon a high-stakes boardroom meeting in order to watch her get a ball-gown fitted. By way of petty but myopic retaliation, she ditches the gown in favor of a stunning and startling red one, a scandal for an unmarried woman to wear to such a formal event and, in Julie's mind, a succinct way of humiliating the image-conscious Preston. But Preston knows that Julie, for all her brazen effrontery, is even more image-conscious than he. When she arrives at the ball and instantly regrets her decision, greeted by the town's pity and contempt rather than their fascinated astonishment, Preston proves his own mettle by forcing her to dance in the center of the abandoned floor, with all eyes locked right on her. Be careful what you wish for, Julie. Julie and Preston's dance of shame before amid a huge periphery of vengeful dowagers and virgins is one of the striking images that d.p. Ernest Haller composes throughout the film. A favored photographer of Davis' from Dangerous in 1935 all the way through What Ever Happened to Baby Jane? and Dead Ringer in the early 1960s, Haller actually was preparing for lensman's duties on Gone With the Wind, and you can see how adept he already was at shooting Dixieland glamour in such a way that its coarse and competitive edges shine right through. But even better is that red dress, which is maybe the reddest dress I've ever seen in a movie, even though Jezebel is shot in black & white. Credit to Haller and to costume designer Orry-Kelly, who found the right frock and got it to gleam just right in the deeper end of the grayscale, but the dismayed insinuations in the screenplay and the worried and flustered faces of the cast play just as much of a role in characterizing that dress, an unforgettable prop even in monochrome. A bunch of second-tier narrative gunk crowds the edges of Jezebel's first act and unfortunately takes center stage in the second. It's all a bunch of fuss about duels, Southern codes of honor, and the grave costs of male pride and female cunning, but it all seems pretty overcooked, and it's not what the primary actors are playing, anyway. Davis, though she had just barely established herself at the head of the Hollywood class, is already playing ironic with her own steely persona, tricking us with the bashful reticence that Julie adopts after the ball-gown episode, only to doff this mask of gentility once Preston turns up with a new, Northern wife. It isn't Davis' most interesting performance; she opened her heart more surprisingly and persuasively in the following year's Dark Victory, and her knack for lethal neurosis hit its peak in 1940 with The Letter, her next collaboration with Wyler. Jezebel finds her taking a first stab at mixing up all these sides of her persona. It's like she's entertaining herself with the confidence that she has made herself a star, and is testing out the flexibility of that star persona to see how far she'll be able to ride it. Answer: far indeed, though the fact that she has an Oscar for playing Julie Marsden but none for her Leslie Crosbie or Regina Giddens or Margo Channing seems perverse. In Jezebel, she's just playing the angles of a mediocre script, just as Haller is playing the angles of her challenging face, and they both yield some treasures that won't really gleam until later, richer exhibitions. Meanwhile, Henry Fonda makes a surprisingly strong impression in the kind of male lead that's often a wash in a "women's picture" like this, even when they're well cast. Biting down on his consonants and flattening his vowels in that Henry Fonda waylisten to what his voice does with the phrase "scandalize a whole town"Fonda's cranky indignation is a piquant match for Davis' waspish vigor, and though the passion between them is a little abstract, their mutually transfixed rivalry with each other is a movie in itself. Still, Fay Bainter walks away with the picture with her remarkably expressive turn as Julie's caring but generally disapproving Aunt Belle, who knows that Julie is ruining more lives than her own even though she feels sad about it. Bainter's face is a gorgeous thing, clear and big-featured like Claudette Colbert's, and she's always the most interesting person to look to in each of her scenes. Wyler is even generous enough, or else just smart enough, to block her in the foreground of several shots where she isn't even speaking. Among other unenviable tasks, Aunt Belle gets caught off guard by the surprise appearance of Preston's new wife, and she then has to be the shoulder and the helpless bystander when Julie races from heartbreak to vengeance in the face of this world-wrecking news. Bainter bears the scene perfectly; her own Oscar for Jezebel marks one of the few times when the Academy picked the right winner, and for a genuinely supporting performance rather than a show-boating cameo by a major star.